As Delta communities continue into the 21st century's global economy, one thing is clear: the most important asset to a community in order to attract business investment, create jobs for its residents, and achieve economic growth is a skilled and trained workforce. 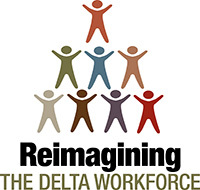 Recognizing this reality, the DRA has launched its Reimagining the Delta Workforce initiative on the heels of a report--Re-imagining Workforce Development--identifying the challenges and opportunities for training a skilled workforce in the Delta region. The DRA has added a fourth R to these strategies: Ramp Up. In ramping up local and regional efforts, the DRA has made available an investment of $1.7 million through the Reimagining the Delta Workforce Capacity Building and Technical Assistance program for communities to train and connect their leadership to begin planning and implementing regional workforce development systems. Additionally, the DRA hosted eight state-specific summits to bring leadership from government, business & industry, and education together to take real steps towards building a pipeline of skilled workers to meet the demand of the globally competitive labor market. One of the national leaders in connecting community and regional leadership with the skills and capacity to create successful workforce development systems is ACT and its Work Ready Communities initiative. Reimagining the Delta Workforce aligns closely with ACT in its programs to work with communities through technical assistance pathways to support local individuals in achieving a National Career Readiness Certificate. More information about ACT's Work Ready Communities initiative and accompanying training opportunities is available at workreadycommunities.org. 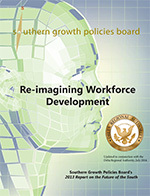 In addition to the Reimagining the Delta Workforce, the DRA prioritizes workforce development in its SEDAP investments, investing into projects that have expanded simulation labs, purchased equipment for training programs in nursing, trucking, auto mechanics, and aerospace, and grown programs that provide direct skills training to the region's workforce.